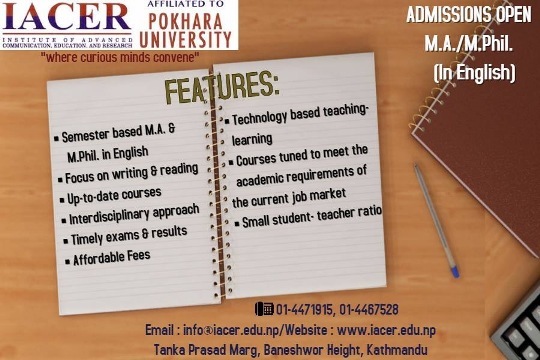 Institute of Advanced Communication, Education, and Research (IACER) has opened admissions in Semester-based, interdisciplinary M.A. & M.Phil. Programs in English for Spring Semester, 2019. Students who have passed Bachelors degree in such academic disciplines as Law, Development Studies, Social Work, Media and Communication, Management, English literature, and Education among other disciplines can apply for admission to M.A. in English program. In its M.A. program, IACER offers courses like Translation Studies, Culture and Tourism, Nepal Studies, Globalization, International Relations and Human Rights, Leisure Studies, History of Ideas, Environmental Literature, Advanced Academic Writing, Media Studies, Culture and Society, Literary Theory and Criticism, Discourses in Discipline, Film and Fiction, and Theatre among other courses. The college opens from 6:30 am to 7:30 pm on working days. Merit Scholarships available. Three students in each program can get Pokhara University scholarship which covers total fees.